This is not only the most famous painting in the Reina Sofia but it is also one of the most famous paintings in Spain of all time. Picasso was born in Malaga and as a teen he moved with his family to Barcelona – which is why you’ll find two museums in Malaga and another in Barcelona dedicated to this painter. He spent much of his working life in France and was highly successful during his lifetime. 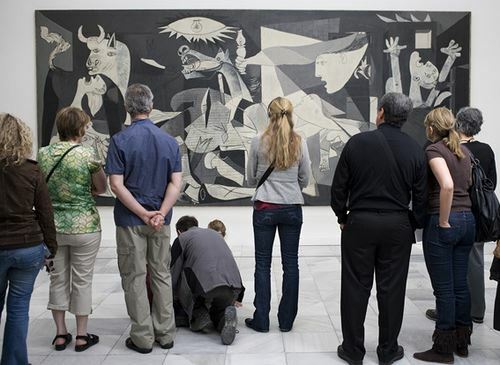 His acclaimed ‘Guernica’ was painted at the height of the Spanish Civil War and depicts the horror of war and the suffering it inflicts upon individuals. It was first exhibited in Paris and then remained in the US until 1981 when it was returned to Spain to the Prado. It was transferred to the Reina Sofia when the museum opened to the public in 1992. Read more about the work here on the Reina Sofia website including this area called Re-thinking Guernica to see the painting in infrared, ultraviolet and much more. See what else is on show in the Reina Sofia here. And check out our guide to what we love about Madrid here. Another ‘must-see’ in Madrid. This oil-on-canvas depicts the young Infanta Margarita and her court servants and if you watch the video below, you’ll learn some of the theories behind the composition including the declining Spanish empire characterised by the faded image of King Philip IV and Queen Mariana who are captured in a mirror. The Prado Museum has 79 more works by Velázquez – so we highly recommend a tailored guided tour to understand the paintings in context. Although the painter was born in Seville – he spent much of his adult life in Madrid as court painter. His style is often described as a forerunner to Impressionism but we encourage you to see the work for yourself and come up with your own impressions and theories. You are correct in thinking that Bosch doesn’t seem like a very Spanish surname. It’s not. The painting was originally hung in a palace in Brussels but was confiscated by the then Duke of Alba in 1568 who brought it to Spain. In 1591 Philip II bought it at an auction and it was displayed at El Escorial Palace until 1939 when it was transferred to the Prado. Very little is known about the painter or the subject matter, but you can glean a lot from the Prado’s documentation and supporting analysis held to mark the 500th anniversary of the passing of Bosch in 2016. If this sounds a bit too much like hard work – just examine the triptych itself which is dazzling and perturbing and inspiring all at the same time. Spell-binding! Another of the most famous paintings in Spain and often referred to as The Executions, this oil-on-canvas depicts Napoleon’s firing squad at work in Madrid. Goya grew up in Zaragoza but moved to Madrid, and became a court painter in 1779 which required him to create portraits of court and country life but he never shied away from the gritty scenes such as this one showing the true cost of war. The Executions is his most famous work because its use of light and perspective is so deceptively simple. See the video below to understand the piece in more detail. At the Prado, you can see the 929 other works by Goya – and again – we recommend you pre-book our Prado expert to help you uncover the many contrasting phases of this painter’s life and work. Read our guide to the benefits of hiring a private guide or driver in Spain here. You will find many of El Greco’s paintings in the Prado (about 42 to be exact) but you’ll need to hop on the high-speed train to nearby Toledo to see his most famous piece. Born in Crete, the painter worked under Titian in Venice (Crete was a territory of Venice at the time). He travelled to Spain in 1577 – first to Madrid and then to Toledo. This painting of a burial of a benefactor of the church of Santo Tomé gained fame for the painter’s ability to capture and combine both heaven and earth, the burial and the spiritual world with serenity and simplicity. A curious fact? El Greco included his own son in this composition and painted his signature on his son’s handkerchief with his son’s date of birth. Although the scene is depicting an event from 1323, El Greco was asked to include the faces of noteworthy members of Toledo’s society of the time of painting. You’ll find many other works by El Greco in Toledo – stop by the El Greco Museum and the cathedral. We can arrange for an El Greco expert to take you around Toledo and help you experience El Greco and this wonderful city to the full. We’ve included Toledo in our guide to the best daytrips from Madrid. 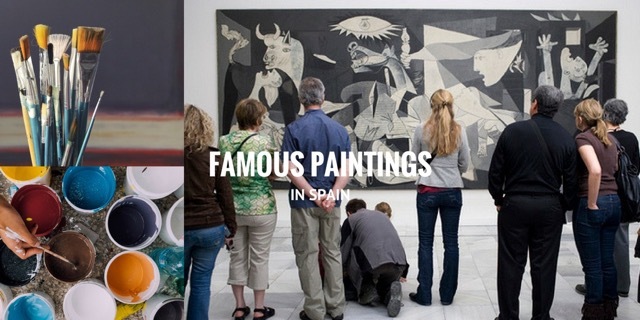 So there you have the 5 most famous paintings in Spain! It would be wrong not to mention Salvador Dali (1904-1989) in any review of Spanish art. Many of his best-known pieces are in museums and private collections abroad, but you can visit his museum in Figueres and his home-studio in PortLligat where you’ll find a great many works on show – and in Madrid – you can see one of his more famous compositions ‘Dream caused by the flight of a Bee’ in the wonderful Thyssen-Bornemisza Museum. Read our guide to Salvador Dali’s Catalonia and Travelling the Costa Brava also. Joaquin Sorolla (1863-1923) is another major figure in Spanish art and we are huge fans of his house-museum in Madrid where you’ll see one of his most acclaimed works ‘Women on the Beach’. We’ve included this museum in our post on niche museums in Madrid. We are also very keen on Eduardo Chillida’s work (1924-2002) which can be experienced in San Sebastian and at the Chillida Leku Open Air Museum (15 mins from San Sebastian – visits by private appointment only). Check out our guide to San Sebastian here. No discussion on Spanish artists is complete without seeing the work of Miró and you can visit the Fundació Joan Miró in a hilltop location just 15 mins from downtown Barcelona. Whilst in BCN, we are also fans of Antoni Tàpies (1923-2012) and you can visit his Foundation too which displays a limited number of his works inside a wonderful modernist building which used to be a publishing house just 10 mins north of the old quarter! You’ll find a number of Tàpies paintings in the Reina Sofia in Madrid also. If you are visiting Barcelona, you should also visit Gaudi’s creations which we’ve compiled in a handy guide here. Wherever you are in Spain, we always recommend visiting the local ‘Museo de Bellas Artes’ meaning the Fine Art museum. And check out the private galleries and contemporary museums also. Being based in Northern Spain we are spoiled for choice with the Guggenheim with Jeff Koons adorable giant Puppy only an hour away in Bilbao, and on our doorstep we have the brand-new Centro Botin. Later this week, we’re looking forward to seeing the Miró exhibition which has just opened. You can read our guide to Bilbao and our 10 reasons to come to Cantabria in 2018. And if you are in Northern Spain, you’re not far from Spain’s other famous paintings – the amazing UNESCO-listed cave paintings of Cantabria. Altamira is Spain’s most famous cave but bear in mind that only 5 lucky people per week are granted entry to the original cave so most visitors only see the reproduction cave. But nearby Altamira, there are over a dozen other UNESCO-listed caves with Paleolithic paintings that can be visited all year round with a guide. For more see our post Cantabria Cave Paintings – The Oldest Art? And don’t forget to leave lots of time for discovering the art of gastronomy and the many wineries with amazing art in Spain! Posted in Getting Around, Madrid, Museums & Galleries and tagged Centro Botín, Chillida, El Greco, Goya, Guernica, Guggenheim, Hieronymus Bosch, Jeff Koons, Las Meninas, Miró, Picasso, Prado Museum, Reina Sofia Museum, Salvador Dali, Sorolla, Tàpies, The Burial of the Count of Orgaz, The Executions, The Garden of Earthly Delights, Third of May, Toledo, Velazquez.